With the advent of technology, people are very fortunate to enjoy fresh milk, canned goods, and fresh fruit juices in the comfort of their own homes. The advances in technology have provided man with the comforts and conveniences in life. Can you imagine yourself picking up oranges and squeezing them with your own hands, every time you want to enjoy a cup of fresh oranges? How about going to the farm and personally milking a cow for a glass of fresh milk? Indeed, it would be very tedious, impractical, and time consuming if people get to do all these things. Thus, with the aid of machines, food processing has become faster and easier. The food industry is probably one of the most important industries to mankind. After all, food is on top of the list of man’s basic needs. Therefore, it is not surprising why many companies dedicate their efforts and investments in the food manufacture and processing. 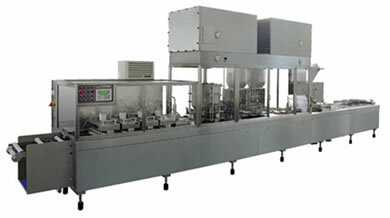 One of the important machines that are used in the food industry is packaging machines. These machines may not be given a lot of attention, but these machines are very important in the industry because packaging is actually the final stage in food processing. It is in this final stage that the processed food is guaranteed safe, tamper resistant, and declared ready for distribution. Food packaging also requires the labeled product to show important information such as nutrition information, date of manufacture, and date of expiry. Moreover, other pertinent information relating to the product is also required in food packaging. Food packaging has become very important in the food industry for several reasons. First and foremost, it is necessary for physical protection. There are particular food products that may require special protection from vibration, compression, temperature, and shock. Thus, these can only be considered and achieved in the packaging stage in food processing. Second is containment and agglomeration. It is typical and practical to group small items together in one container or package for efficiency. If small items are packaged together in one container or unit, it would be easier and faster to handle these items. Finally, food packaging is important in marketing. No product is ever marketed commercially without any label. Consequently, no consumer would buy any product without the necessary information and details about the product as well. Therefore, in order for products to be bought and purchased, these have to be packaged and labeled.